Don’t go to Gibson’s Italia, the famed Chicago steakhouse’s Italian spinoff if you want an ordinary, inexpensive meal. Go to the restaurant, opened Fall 2017 by the Gibson Group, for the same reason you would go to its parent – fine food. On a recent visit for lunch, I, who always take home doggy bags, ate the whole platter of 7-year aged Acquerello Risotto. Mine came with black truffles and porcini mushrooms. 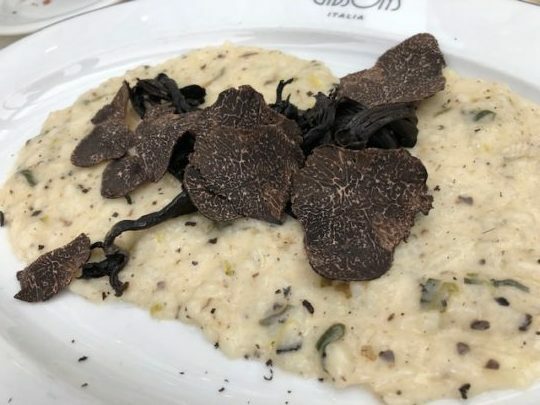 What is on the menu is 7-year aged Acuerello Risotto with sea scallops for $29 (scallops cost more) and 1-year aged Acquerello Risotto with tomato sugo for $18. If possible, go for the 7-year aged item. It’s heaven on a platter. Acuerello produces the best rice for risottos. The product is richer and healthier because aging stabilizes the starch and the rice has gone through a long selection and processing operation. Yes, you can get tasty Italian meatballs as a starter for just $12. But you should put it together with other dishes on the menu such as pasta and salad for lunch or if doing a 5:30 p.m. stop at the restaurant’s popular bar for cocktails (always crowded because the cocktails are terrific). But if coming for the restaurant’s superb food, try some menu combinations not experienced before. 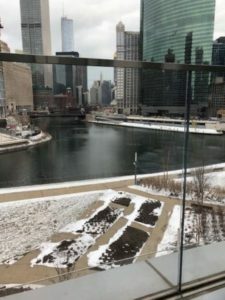 Then, linger to savor the dishes and the restaurant’s stunning view of the Chicago River and skyline. Gibson’s Italia is just north of the Ogilvie Transportation Center at 233 N. Canal St., Chicago. For the menu, reservations and more information call (312) 414-1100 and visit GibsonsItalia and GibsonsItaliaMenu.